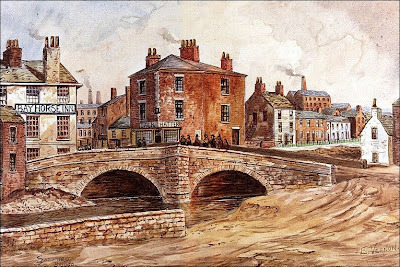 A painting by E. Vernon of the old pack horse bridge, which crossed the Blakewater in the centre of Blackburn. This ancient bridge had stood for centuries until the 1840's when it was demolished and the road widened. The bridge pictured was only 15 feet wide. To get some perspective, the mill to the right of the image, with the smoke rising from its chimney, was Spring Hill Mill, which was situated above what is the present day Boulevard, sort of in the Cicely direction. All the properties pictured would have disappeared around the time of the demolition / road widening of the 1840's and in the following few decades. The white gable on the extreme right, is approximately where the White Bull Hotel would be built (probably further back, due to the widening of the road) and where the river disappears off to the left, is where Water Street would be. Colin, am I right in thinking that the Bay Horse Inn in this picture was in the same location as the later one which I remember? Although E. Vernon's original Black and White sketch includes two Women talking to each other near to the wall and a man about to cross over the bridge,I think that this coloured sketch is more interesting. But in both drawings he seems to have made the River Blakewater more of a River than it actually was.I can only remember it as being about 4Ft wide for most of the time unless it had rained heavily, then it did get a bit of a "Raging Torrent" but not to the extent of what it is shown in the drawings. I have a very similarE Vernon watercolour titled Salford Bridge. It is a very slightly different perspective, with all of the red brick building on the left included (rather than part of it) and more distant hill landscape on the right.There are two female figures in front of the wall in the foreground, and a horse and cart on the bridge. Did he paint many versions of this view? I don't know how many versions he painted, but I do know the one you're talking about. If you go onto the Facebook group Blackburn Past and type Salford Bridge into the search on there, both versions are on there, including a black & white version (or two). There's photographs from the 1800's too, showing all of Salford, Ainsworth St, Church St and vicinity under water. So although it was culverted and tamed in more modern times, maybe the artist depicted it correctly and as it was in his / her day. Is there a black & white sketch by E. Vernon John? I knew I had a black & white drawing somewhere, so just dug it out to compare the two, but the one I have is one of Chas Haworth's drawings and shows someone herding sheep or cattle over the bridge. This print got me thinking as to the whereabouts of the source of the River Blakewater Colin. I've looked on the maps which I have, and I've also looked on Google Maps to see if I could find it,but it seems to disappear from view on Phillips Rd in Little Harwood.So I can only assume that it starts somewhere up in the Cunliffe Hills area.Do you have any idea of it's origin Colin? I once did the same John and got lost / gave up around the same area as you. I thought perhaps the Cunliffe Hills or maybe the Shadsworth / Guide / Knuzden area, but there are brooks and streams from those areas that do descend into town, but seem to join the Blakewater more central, rather than at Little Harwood. There's another little brook or stream (I think it's called Little Harwood Brook) that also seems to come down from the Cunliffe or Sunnybower area. It's the one that bypasses the cemetery and the old Lion Brewery site. I think it joins the Blakewater near Notre Dame Convent. Talking of rivers. Did you know that 300 million years ago there was a huge river that ran through where Corporation Park is now. It formed that rippling effect on the rocks towards the top of the park. I read that on a plaque by the Devil's Rock, just last week. Hello I have acquired three watercolours by Herbert Railton 1857-1910. Salford Bridge 1857 is one of them,which i am reliably told was painted in the 1880s by the said artist,but was painted from a earlier illustration. It is titled Salford Bridge 1857,however my two queries are was the bridge rebuilt when the road was widened,and secondly is it fair practise for an artist to paint an earlier view at a later date or am i getting it all wrong? Without checking through some books (which I haven't the time to do at the moments, sorry), I'm pretty sure they rebuilt the bridge in the 1840's, because as I mention in my comment above, the road/thoroughfare above it went from being 15 feet wide to being 60 feet wide. The road was also made more flat, whereas in the picture above, you can see it was a hump back bridge prior to the 1840's. As to your second point, yes, I think it is quite common for artists to paint/sketch earlier views. There are many scenes of old Blackburn which were painted/sketched decades later, half a century later and beyond. In fact there are people today (John L Chapman for one) who recreate scenes from the last century and the century before it. Blackburn Museum would be able to help you further. They have numerous examples of Railton's work, mainly in pen and ink (not too many, if any of local scenes though). I don't think they are on display, but they have them. They did an exhibition of his work 10-15 years ago and a little 12 page booklet was published around the same time. They probably still have copies for sale at the museum. Railton was greatly influenced by a Blackburn artist called Charles Haworth. There are a few examples of his work on this blog. Just type in Chas Haworth in the search in the top left corner and something should appear.